Happy Birthday Texas And Sam Houston! The slow moving, quiet waters of the Brazos must have been a stark contrast to the raised voices coming from inside the log cabin just a few yards from its banks. Inside the wood cabin, the Republic of Texas was born. It was March 2nd, 1836. 176 miles away the Alamo was beseiged by the Mexican army led by Santa Anna. Fifty-nine men signed the declaration of independence from Mexico. Two were native Texans. Only ten of them had lived in Texas more than six years. Sam Houston had come to Texas only four years before. It is one of the sublime accidents of history (if one believes in such things), that Sam Houston shares his birthday with Texas. March 2, 1836 was Sam Houston's 43rd birthday. 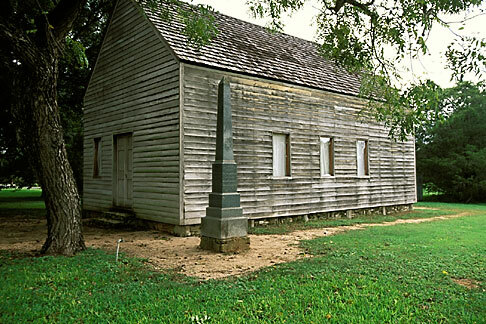 Sam Houston had already lived a famed life before coming to Texas. Born in Virginia, he had fought in the War of 1812. He established a legal practice in Tennessee and was elected to the U.S. House of Representatives. Washington, D.C. did not agree with him. He was once chewed out by John C. Calhoun for appearing at a meeting to discuss Indian affairs dressed as a Cherokee. He ran for Governor of Tennessee and won the office. He might have stayed on and perhaps run for President of the United States, but he resigned after the dissolution of his first marriage. Mr. Allen, the most unpleasant & unhappy circumstance has just taken place in the family, & one that was entirely unnecessary at this time. Whatever had been my feelings or opinions in relation to Eliza at one time, I have been satisfied & it is now unfit that anything should be averted to....The only way this matter can now be overcome will be for us all to meet as tho it had never occurred, & this will keep the world, as it should ever be, ignorant that such thoughts ever were. Eliza stands acquitted by me. I have received her as a virtuous wife, & as such I pray God I may ever regard her, & trust I ever shall. She was cold to me, and I thought did not love me. She owns that such was one cause of my unhappiness. You can judge how unhappy I was to think I was united to a woman that did not love me. This time is now past, & my future happiness can only exist in the assurance that Eliza and myself can be happy & that Mrs. Allen & you can forget the past, —forgive all & and find your lost peace & you may rest assured that nothing on my part shall be wanting to restore it. Let me know what is to be done. Sam later requested that one of Eliza's relatives "...publish in the Nashville papers that if any wretch ever dares to utter a word against the purity of Mrs. Houston I will come back and write the libel in his heart's blood." 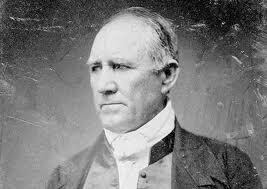 We could use more Sam Houston in our politicians these days, don't you agree? The Convention at Washington on the Brazos also made Houston the Commander-in-Chief of the Texian Army. But he was a commander without an army. The job of building the army was left to Houston. Moreover, it began to appear that March 2nd would be the high water mark for the Texas revolution. First, word came that the Alamo had fallen, with all of its defenders dead. On Palm Sunday, March 27, Santa Anna executed 342 Texans captured at Goliad. Santa Anna pursued Sam Houston across southeast Texas while refugees fled from the path of the Mexican army. Santa Anna was contemptuous of the Texian Army and split his forces to more quickly capture the leaders of the revolutionary government and deal with Houston simultaneously. Fortunately for Houston and the Texians that contempt grew into arrogance. Santa Anna's arrogance led to a crucial mistake. Preparing for an attack on April 22, Santa Anna rested his army on the 21st and settled in to plan the attack. Surely, the Texians would not dare attack in open daylight across an open field. Yet, that is exactly what Houston decided to do. It was a gamble that paid off. Because Santa Anna failed to post sentries, the Texians achieved complete surprise. As they advanced, the Texians sang a popular tune to a single fife and drum "Will you Come to the Bower?" Will you come to the bower I have shaded for you? Your bed shall be of roses, be spangled with dew. Will you, will you, will you come to the bower? With a blush on your cheek, but a smile in your eye. Will you, will you, will you smile my beloved? nor the dew be so sweet as the kisses we'll sip. Will you, will you, will you kiss me my beloved? An odd song for soldiers entering battle, no? But, what better image to have in one's mind's eye at such a moment than their wives and loved ones at home? Most of Santa Anna's professional soldiers were caught unarmed and asleep. It was a rout that lasted only 18 minutes. 700 Mexican soldiers were killed with another 200 wounded. The Texians lost nine men with 30 wounded. Sam Houston was among them leading the infantry during the battle. He was shot in the left ankle and had two horses shot from under him (again, in only 18 minutes). There on the grassy plain Texas won what it had declared on March 2, 1836, its independence as a nation. Happy Birthday Texas! Happy Birthday Sam! Thank you and God bless you both!